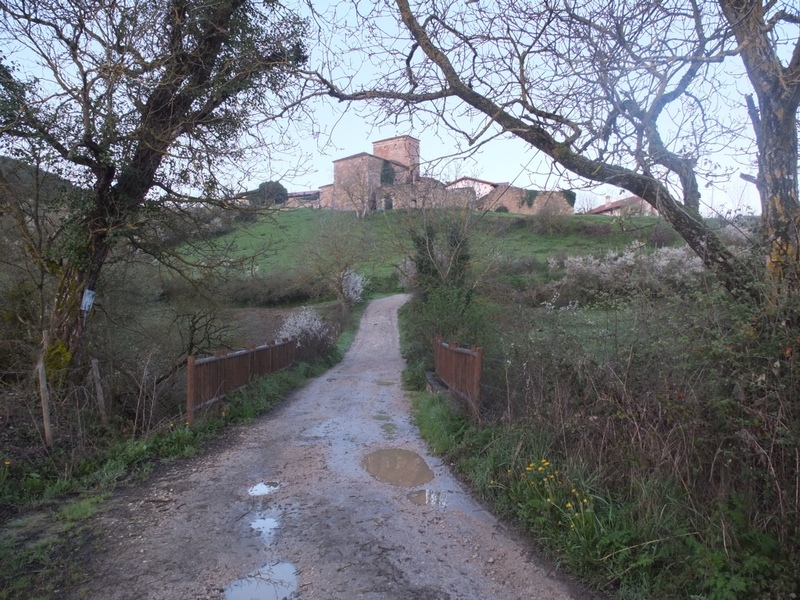 The other night I had a vivid dream I was walking along an early section of the Camino – from Zubiri to Larrasoana. In the dream I recalled detail I thought I'd forgotten – the little waterfalls in the creek beside the stream, the coffee stop and the breakfast I ordered. A stone farmhouse on a hill framed through blossoming trees. These kind of recollections leap at me through the day, too. For no apparent reason, I'll suddenly recall moments walking, or stretches of the track. The most vivid of these recollections are always about The Way, not about the pilgrims I met on The Way. It's as though the power of the track itself, the Camino, won't let go of me. It's as though it has burnt itself into my psyche. But what's strange is that, in my mind, I can remember what was over the next hill, what was around the next corner, what was beyond the bridge. My memory's usually not that good! But there are things I grasp to remember, too. And that's what makes me want to go back and walk it again. This memory thing regarding “snapshots, or rather snap-videos” of some moment on your Camino will happen time and time again, Bill. It seems to go on for years! I enjoy this phenonomen! That’s a wonderful prospect, Anne! Bill, what’s the building in the background of the first photo? For several years I counselled people who were returning from extended retreats, some of them solitary and extremely isolated.There is a syndrome affecting the newly returned that manifests in flashbacks and vivid, sometimes lucid dreams.Its as though your spirit, which became finely tuned to your PGS,the sounds and scents around you, the colours and contrasts of the new environment, is experiencing a sensory overload due to the input of formerly familiar sounds. Its almost a positive version of post traumatic stress syndrome (which I do not mean to taking lightly. Its a crippling, tragic illness) in the way it can apear quite suddenly while you are doing or thinking about something else entirely.Unless it is upsetting to you, enjoy! Dear Sister – the building in the background was, I thought, a large farmhouse – I don’t think it was a church, although I was surprised as I got closer just how large it was. It was about 5-8kms from Zubiri, I think. What you say about a positive PTSS is fascinating – I hadn’t thought about it that way, but you are probably right. If if had been a traumatic episode, it would probably be affecting me the same way. Strong dreams, vivid recollections etc. That phenomena is exactly what has me returning this September. It amazes me how still I will awaken with such vivid thoughts of the Camino. I love these memories and I like Sister’s explanation of it, and yes, thankfully they are wonderful memories for me also! You must be getting excited Arlene – September is not that far away! It’s an unexpected benefit, these flashbacks, I have to admit! And fortunately, my mind doesn’t dwell on all those times I struggled and had to push through pain. I like the selective nature of my mind! 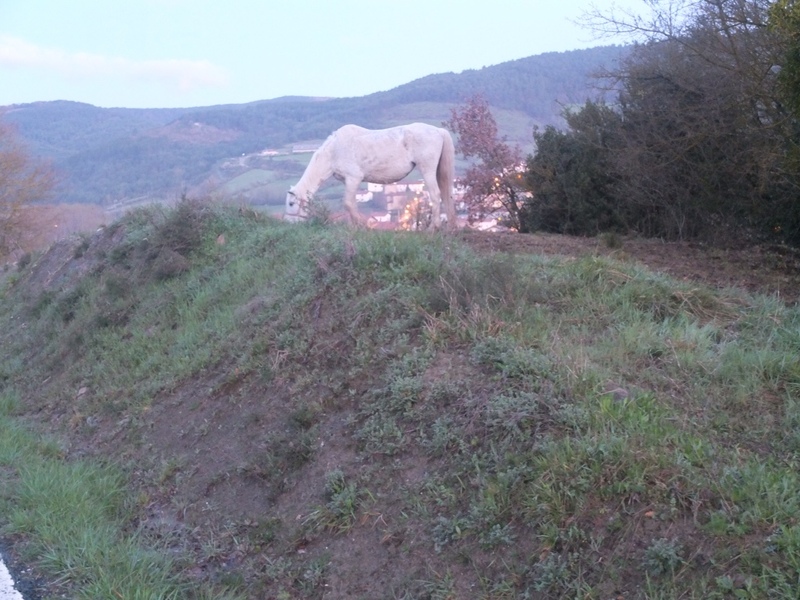 The white horse in the paddock of trees that I’ve posted earlier does look like it has unicorn tendencies! But what’s strange is that, in my mind, I can remember what was over the next hill, what was around the next corner, what was beyond the bridge. This happened to me once, whilst awake and on the Camino itself and despite the fact that I had never been on that particular section ever before. Lasted 20 minutes or so, which meant I was able to positively rule it out as being déjà-vu by testing it. I’m getting my own resonance with the Camino these days, with my neighbour who wants to walk to Santiago, and on Friday I met another local pilgrim, who walked from Le Puy to Compostela over the course of four years i stages. You feel it. You know that feeling. It tells you it’s not IF, it’s WHEN. That story about God shaking you up – that’s amazing. But it makes sense. I will be fascinated to follow your journey should you walk the Camino again. What Sister said about PTSS, was interesting. For me especially…..as I get older I find I have more and more flashbacks of some pretty horrible events in my life…at times its like a movie on repeat. But the same thing happens with the Camino as well…..and gosh that feels good. I like that I have something so good in my life that I can call upon to “play” when I need a boost. I am amazed that when I look at photos or you tube clips of people’s journey; once they get to La Faba (which is where I started) and onwards I know exactly where they are at almost every point. Bill…I have said it before…but I love that you are including us in with your reflections of the Camino. Thank you! Hey Abbey, it’s strange how it seeps into your soul when you’re not even looking! And yes, Sister’s concept of a positive Post Traumatic Stress Syndrome is really really fascinating. And wonderful to think that the mind can react in such a way, if we’re overwhelmed by something that has a strong empathetic effect. Its true, The mind has a huge intuitive/sensory capacity that can work in both positive and negative ways with memory. It can be trained to heal in PTSS, or tune in to lucid dreaming for positive memory reclamation.I have found it a fascinating field of study, and very interesting and rewarding work. Thank you – – a LOT! I have been wondering if there was something gone wrong with my “wiring”. Seven months after return and the dreams have not quit nor even lessened. While awake, there are flashbacks which snap me back to ‘peregrino’ mindset when situations arise that formerly would have led to anger and/or frustration. No regrets about these ‘symptoms’ but the adjustment is taking some getting used to – for me and others. A lot of folks are just not comfortable with the changes. Though I’ve never looked for much validation from others, I am pleased to see that my experience is not totally unique. No worries Brendan. Strange experiences, hey? No one tells you this is an additional benefit o the Camino!